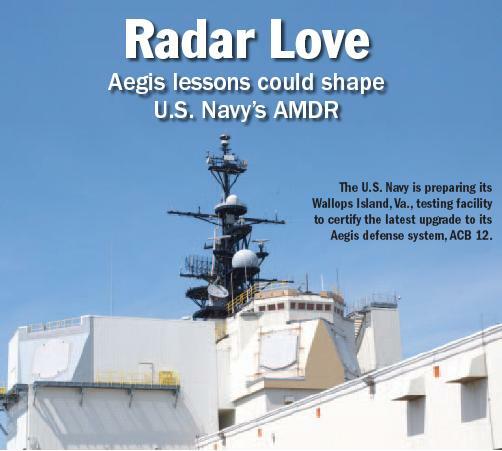 Contractors vying for the U.S. Navy’s proposed Air and Missile Defense Radar (AMDR) say they can deliver the system for much less than the government’s cost estimate because of their extensive experience building similar radar programs in recent years. Such arguments are becoming increasingly important as Washington scrambles to find bill-payers while eyeing expensive defense programs. officials, but contractors say the GAO calculations rely mostly on historical data on building sophisticated radar systems largely from scratch. That fails to account for technology and production advancements made by other military projects that can be leveraged to develop and deliver AMDR, contractors say. says Brad Hicks, Lockheed’s vice president of naval radar programs. That Navy AMDR officials did not even flinch at such an estimate indicates their commitment to the program and acceptance of its high cost, as well as the rising importance of ballistic missile defense (BMD) as a Navy mission priority. AMDR combines an S-band radar for BMD and air defense and an X-band radar for horizon search, with a controller to integrate simultaneous operation of the two. The Navy also is revamping its Aegis radar system to perform BMD missions— while opening up the network to more contractor competition. The enhanced Aegis system is on its first deployment on a U.S. Navy vessel, the Ticonderoga-class guided-missile cruiser USS Monterey CG-61, in the Mediterranean. It is serving as part of the U.S.’s European Phased Adaptive Approach for BMD there. The Navy and Missile Defense Agency (MDA) plan to nearly double the number of BMD-capable Aegis ships to 41 by the end of 2016. Some Pentagon and Navy officials have started to talk openly about possibly changing the U.S. nuclear posture, cutting back from the traditional nuclear triad of intercontinental ballistic missiles, bombers and ballistic-missile submarines to a dyad focused on the Navy and MDA efforts. But developing the BMD focus takes time and money, as the Aegis system has shown. The February 2008 shoot-down of a defunct U.S. space satellite by the USS Lake Erie CG-70 proved the system’s capability, and an MDA test in April demonstrated its “launch-onremote” system against an intermediate- range warhead separating from its booster missile. But it took nearly three decades for the Navy and industry to bring Aegis-like capability to the fleet. “Aegis is a very large, integrated and complex system,” says Bill Bray, director of Integrated Combat Systems for the Navy’s Program Executive Office, Integrated Warfare Systems. When Aegis baselines were developed in the 1970s, “combat systems were developed for a platform they were landing on and every platform ended up with its own combat system,” Bray says. Cruisers and destroyers have their own Aegis systems—and certain groups of each ship would get their own baselines, depending on when they were delivered or available for an upgrade. They all have the basic Aegis core, but with different baseline capabilities, integrated systems and system architectures. This means that when there is a problem, all the baselines have to be addressed; it is not possible to fix just the core software package and redeliver it. Aegis development cost estimates range from $30 billion to $80 billion, including ship integration, according to some analysts. Even Lockheed Martin says it is not sure, but the latest Aegis system industry standard cost is about $1 billion per ship. starting with ACB 08 in 2008 and continuing next year with ACB 12.
move the Navy closer to AMDR development. beam-forming, a key AMDR technology. distributed receiver and exciter modules for antiair- warfare modes. “We don’t see another way around this [AMDR] except with an AESA,” says Arun Palusamy, Northrop Grumman’s director of integrated air and missile defense and naval strategy. Northrop Grumman also points to its participation in the DDG-1000 Zumwalt-class destroyer program, which initially was planned to mate X‑ and S- band radars in an AMDR-like suite, such as the one being developed for the CVN-78 Ford-class aircraft carrier. Raytheon, the prime contractor for the DDG-1000 radar system, collaborated with Northrop on the Cobra Judy Replacement program that marries shipboard S- and X-band phased arrays to collect BMD data. Raytheon provides the Cobra Judy Replacement S-band system’s back-end signal processing. “AMDR is similar to the work to Zumwalt, CVN-78 and Cobra Judy,” says Denis Donohue, Raytheon’s director of above-water sensors. AMDR will be a magnitude better than anything the Navy has fielded or planned, says Capt. Doug Small, Navsea’s AMDR program official.